How to use the Front of Your Home to its Best Advantage! Some will say you can tell a lot about a house by the way the outside looks, from what colour door it has, to the way the homeowners have pruned their garden. 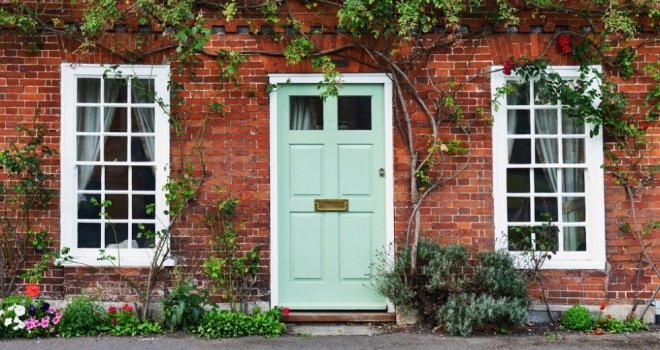 To help you make a great first impression with your home, Anglian Home Improvements and Landscaping Expert Gena Lorraine from Fantastic Services have analysed 500 photographs using the popular #doorstagram hashtag on Instagram to give you the lowdown on exterior trends, and provide tips on how to make your home look appealing to visitors. Colourful doors are a great way to make the front of your home stand out and add a splash of your personality. Analysis of 500 doors using the #doorstagram hashtag shows that blue is the most popular colour, accounting for more than a third of the most photographed doors, followed by red and black with 10% each. Trellises adorned with colourful flowers, hanging baskets and potted plants are perfect for creating a stylish exterior and masking any imperfections that the front of your home may have. A tenth of the photographs analysed featured climbing plants such as flowers draped across the door or the side of the wall, and a fifth (20%) had plant pots on their doorstep. Gena recommends adding various plants such as “petunias, fuchsias, portulacas and geraniums”. Adding lights to the front of your home will not only help you see at night, but they are a fantastic way of highlighting some of the features in your garden such as footpaths or adding accents to your prized shrubs. Almost one in ten of the photographs featured had lighting, most of which were traditional, Victorian-style lanterns. “Remember that lights should be used sparingly as you wouldn’t want to illuminate your entire neighbourhood,” said Gena. As well as the door, kerbs are one of the first things guests will see when they arrive at your home. Gena said: “Kerbs are like a greeting card. If they’re in bad condition, then people will be sceptical about the interior of the house and look for faults everywhere.” Power wash the outside of your home to ensure everything stays fresh and clean and consider adding a lick of paint to spruce tarnished fences and doors. There are many ways to style up your door, from changing its colour to adding new handles, knockers or even a wreath. Adding accessories to your door is a great way of drawing attention to the front of your home and adding style to a blank canvas. Our research shows that classic Victorian door knockers (16%) and black ironwork handles (22%) are the most popular accessories, but other photographed items were flags, brass lion door knockers and stained glass. Liza Wrigley, Digital Marketing Manager at Anglian Home Improvements, said: “Instagram is a great source of inspiration for any budding interior and exterior designer, as it shows exactly what people look for in a home.